As previously reported, a Studio Ghibli theme park is in the works. It was originally planned for 2020, but it’s now pencilled in for 2022. Here is a look at what to possibly expect. 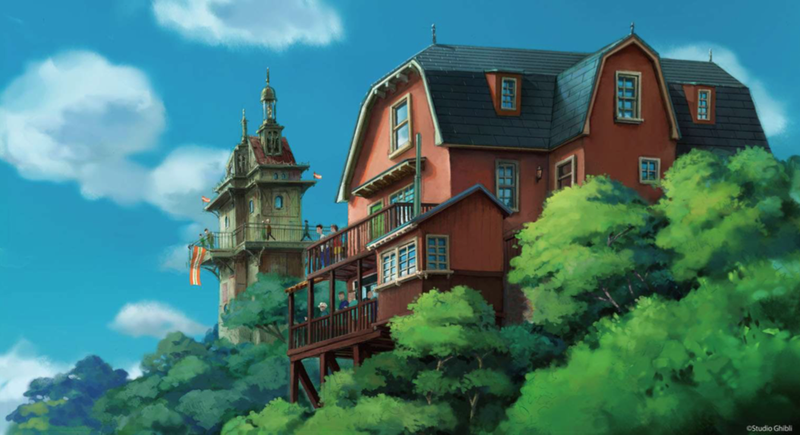 Ghibli Park will be located on a 200-hectare plot of land on which the 2005 World’s Fair was held near Nagoya, Japan. The focus will be on bringing Studio Ghibli to life in a way that allows parkgoers to also enjoy nature. According to NHK, the main gate should remind park goers of 19th-century structures out of Howl’s Moving Castle (top image) as well as a recreation of Whisper of the Heart’s antique shop. The Big Ghibli Warehouse, which is filled with all sorts of Ghibli themed play areas as well as exhibition areas and small cinemas. Witch Valley, which will feature attractions for Howl’s Moving Castle and Kiki’s Delivery Service. Dondoko Forest, which is Totoro themed. The area takes its name from the “dondoko dance” Mei and Satsuki do with Totoro. This area is already home to the house from My Neighbor Totoro, which was built for the 2005 World’s Fair.